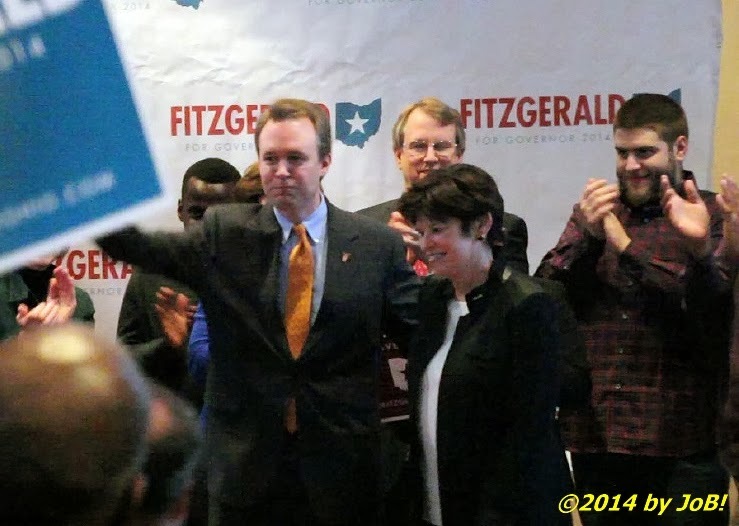 Ed FitzGerald and Sharen Neuhardt (center left to right, respectively), Democratic candidates for governor and lieutenant governor, wave to supporters at the conclusion of their Dayton, Ohio rally on Saturday afternoon. Just one day after making the announcement, Cuyahoga County Executive and current Ohio gubernatorial candidate Ed FitzGerald formally introduced Dayton-area attorney Sharen Neuhardt as his gubernatorial running mate in front of approximately 150 enthusiastic supporters at that city's Cultural and RTA Transfer Center on Saturday afternoon. Each were warmly welcomed by recently elected Democratic mayor Nan Whaley and both took turns attacking the policies of incumbent Republican governor John Kasich during the nearly three-quarter hour event. Democratic candidate for Ohio lieutenant governor Sharen Neuhardt addresses the crowd at the Dayton Cultural and RTA Transfer Center on Saturday afternoon. Standing behind her is her husband, David. A two-time runner-up in local congressional races in 2008 and 2012, Neuhardt brings a solid pro-life and pro-woman focus to the ticket. Those credentials were highlighted when she said, "John Kasich and a lot of the Republicans say that Ed picked me, basically, because I have ovaries". 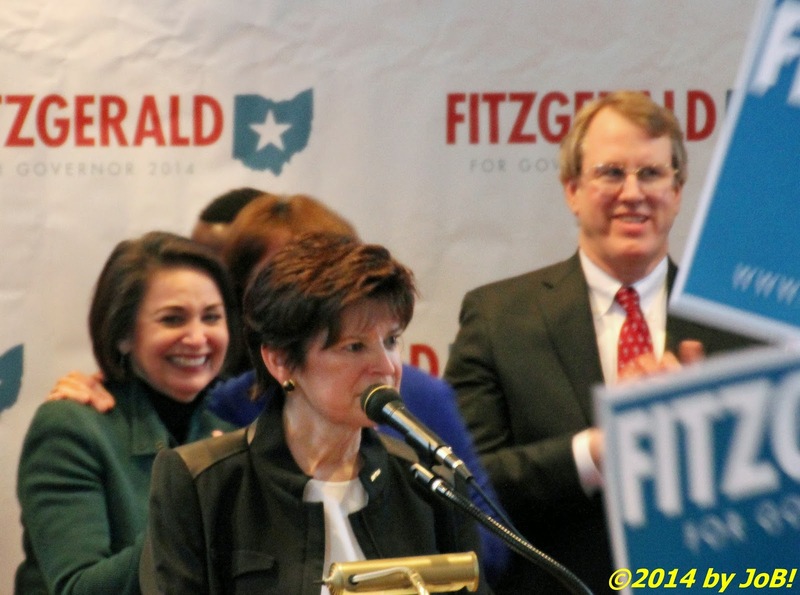 After a wave of laughter subsided, she continued, "Ed Fitzgerald picked me because I have a brain. Women in this state have brains...we have memories...and we vote." Neuhardt continued to pound on Kasich's record on women's issues, specifically the drastic reduction in funding to Planned Parenthood, an organization that many women in the state rely upon for reproductive and preventative services, such as pap smears and mammograms. She capped her criticism by saying "relegating women to second-class citizens is bad business for Ohio." Democratic candidate for Ohio governor Ed FitzGerald delivers remarks at the Dayton Cultural and RTA Transfer Center on Saturday afternoon. 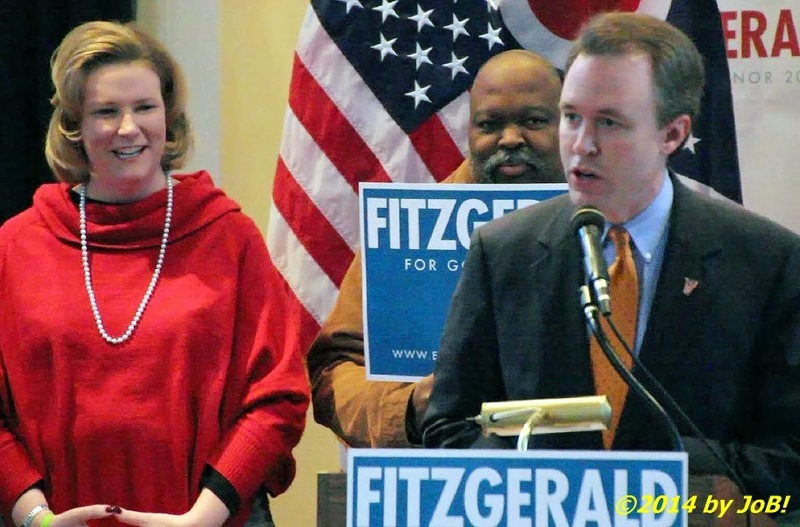 Dayton mayor Nan Whaley and an unidentified campaign supporter are behind FitzGerald on the stage. FitzGerald followed his running mate at the podium and his remarks primarily focused on economics and inequality. "The governor represents a small group of people," he said, and "you're either on the inside or the outside" when dealing with the Kasich administration. He stated that funds for schools and education programs have been reduced in favor of tax cuts for the rich because "favors are repaid." He acknowledged that the Democrats lost the 2010 election by only 77,000 votes but recent polling shows him only two points behind the incumbent. He concluded by saying "the most powerful thing is a conversation between two people about what's really going on," and that his ticket is ready for "seven million conversations" in the coming months. After a short joint photo-op onstage, both FitzGerald and Neuhardt navigated their way through the audience to personally thank the well-wishers who braved an impending snowstorm to attend the event. 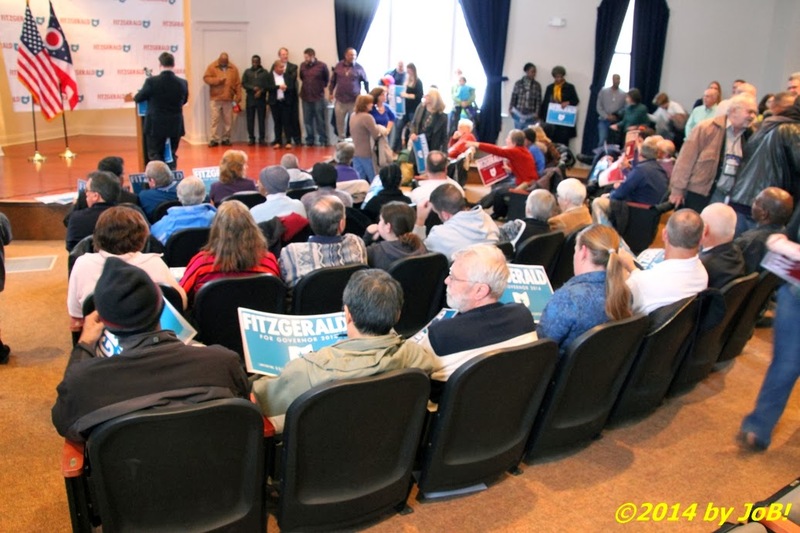 Campaign signs are handed out to the standing-room only crowd prior to the start of the FitzGerald-Neuhardt rally at the Dayton Cultural and RTA Transfer Center on Saturday afternoon. Neuhardt's selection this past Friday was the result of FitzGerald needing to find a replacement for his original choice, State Senator Eric Kearney. He was forced to withdraw in December after it was discovered that he owed over $750,000 in back taxes and penalties related to a private publishing business. Unless disqualifying issues come up in her background, the duo will be on the May 6 primary ballot to seek the nomination of the state's Democratic Party to go forward to the November general election. Neuhardt's placement on the ticket helps to provide both a gender and geographical balance as well as heighten interest in the greater Dayton metropolitan area, one of the state's most solidly leaning Democratic constituencies and its fourth largest media market.